It is with great pleasure that we bestow the 2015 Selig I. Goldin Award to the Honorable Charles D. Edelstein. Spanning over 50 years of practice in Florida courts, Judge Edelstein has touched – and improved — nearly every facet of the state’s criminal justice system. It is for attorneys like him, who embody the highest level of professionalism, that this award was created. After clerking at the Third District Court of Appeal, Judge Edelstein joined the State Attorney’s Office in Miami where, as an Assistant State Attorney, he was elevated to the Felony Division faster than anyone had ever been in that office. In addition to litigating general felonies, he was assigned to the Special Prosecutions and Organized Crime Unit where his advocacy skills really sharpened. From there, he spent 14 years in private practice litigating trial and appellate criminal cases before he was appointed to the County Court in Miami-Dade County. As part of that appointment, he not only served as Acting Circuit Court Judge for a significant time, he was specially assigned by the Chief Justice of the Florida Supreme Court to preside over cases in Manatee, Sarasota, and Monroe Counties. He also served as a Special Master in the Civil Complex Cases Division and General Master in the Family Division in Miami-Dade County where he presided over some of the more difficult cases in Miami – always exhibiting the utmost respect for the litigants, their attorneys, and the court personnel with whom he worked. But it is outside of the courtroom that Judge Edelstein distinguished himself. As a longtime judicial administration consultant, he has helped remedy the enormous caseload backlog that strangles court systems across the country. In Florida, for example, he spearheaded reforms in caseload management practices in Dade, Seminole, Brevard and Valise counties. He did the same for court systems in Arizona, California, Georgia, Illinois, Indiana, Massachusetts, New York, Nevada, Pennsylvania and Wisconsin, in addition to consulting with the National Institute of Law Enforcement and Criminal Justice and the Florida State Court Administrators Office. He helped design the automated case citation system that is used to this day by every court and every litigant in Florida. In the area of jail reform, where prison overcrowding sometimes resulted in intolerable conditions for inmates, Judge Edelstein worked with the correctional systems in Florida, Arizona, California, Illinois, Indiana, and Wisconsin. Each of these projects coordinated efforts in the courts and the departments of corrections to ensure their continued vitality in future years. For his outstanding service to the Brevard County Sheriff’s Office and the Citizens of Brevard County. His leadership and thoroughness regarding his extensive review of the criminal justice system in Brevard County will result in positive long-term solutions and in a better and safer community for all of us. We are very fortunate we were in the path of this very good, caring and knowledgeable man. In addition to this, Judge Edelstein served as court consultant to the National Organization for Victims Rights, consultant to Public Defender Offices in Florida, Arizona and Indiana, and consultant on the law-enforcement needs of the Army Corps of Engineers Recreational Facilities. Judge Edelstein served as a professor/lecturer at the University of Miami School of Law (Director of the Trial Advocacy Program), Florida Atlantic University, the Florida Judicial College, Southern California University (Director of Judicial Administration Program), the Institute for Court Management (Associate Dean), the National Sheriff’s Institute, the Air Force Security Officer’s Program, and the Metro-Dade Police Academy. He has served on judicial management and technology committees for the Florida Supreme Court and victim-rights and battered-spouse committees around Florida and across the county. 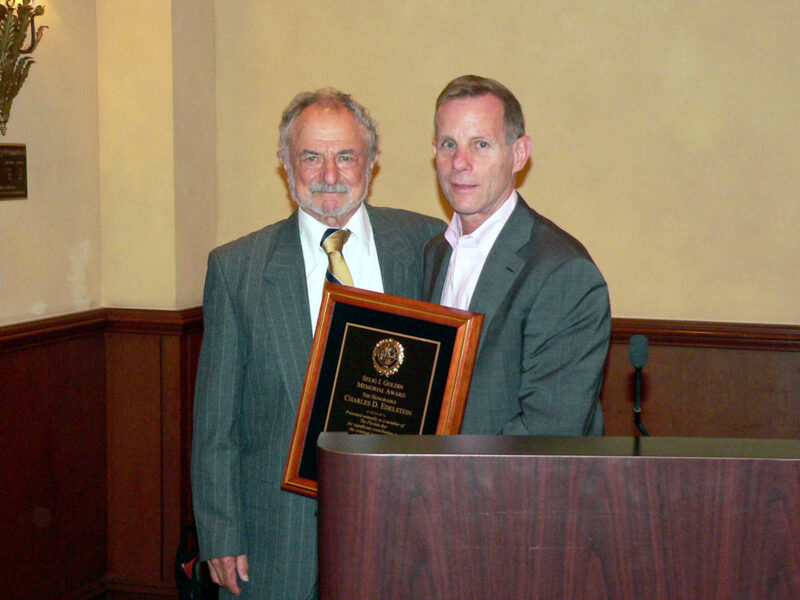 Former Selig Goldin Award recipient and former Chief Judge of the Third District Court of Appeal Phillip A. Hubbart described Judge Edelstein as a “renaissance man” with extraordinary talent. That says it. Over the past 50 years, and in so many ways, he has improved how our criminal justice system operates for all of those who pass through it.